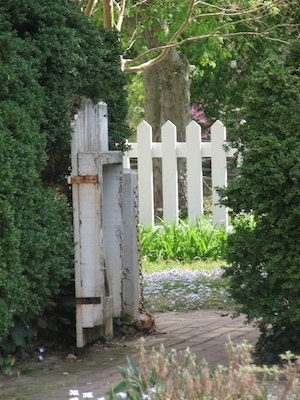 Colonial Williamsburg presents its 69th garden symposium “Layers of the Living Landscape” April 10-12. Landscape consultant and photographer Rick Darke and Doug Tallamy, professor of entomology and wildlife ecology at the University of Delaware, authors of “The Living Landscape:­ Designing for Beauty and Biodiversity in the Home Garden,” lead a team of experts who share their expertise on using plants to create and maintain a layered landscape. Prior to the official opening of the conference, two optional programs are offered: “Bassett Hall Woods, a Forest in Transition,” a walking tour led by Colonial Williamsburg historic gardener Wesley Greene, $15; and “Layers of Flavor,” a demonstration and tasting of vegetable-inspired cuisine led by Executive Chef Rhys Lewis, $35. The conference opens at 5:30 p.m. in the Hennage Auditorium at the Art Museums of Colonial Williamsburg, 326 W. Francis St. Peggy Cornett, curator of plants at Thomas Jefferson’s Monticello, takes a look at Jefferson’s observations on natural history. Darke and Tallamy’s morning presentations include a book signing and question-and-answer session. Afternoon presenters include James Orband, senior extension agent emeritus, Yorktown, who looks at the ground layer of the landscape; and Robert Lyons, Ph.D., professor emeritus and former program director, Longwood graduate program in public horticulture, University of Delaware, who introduces the subject of the color of native plants. The day’s programming concludes with a landscape practicum that examines the garden challenges attendees submitted in advance. A panel of experts tackles real issues using a selection of the submitted photographs. Pam Beck, author and photographer from Wake Forest, N.C., discusses the use of vines in the garden, and Peggy Singlemann, director of horticulture for the Maymont Foundation and co-host of WCVE’s “Virginia Home Grown” examines the shrub layer. Peggy Cornett introduces the layer of roses. The afternoon session includes a look at the trees in mid-Atlantic gardens with Les Parks, curator, herbaceous plants, Norfolk Botanical Garden. Andrew Koenig, ISA, a board-certified master arborist with Bartlett Tree Experts, examines the canopy layer. The day concludes with Beck discussing the creation of intimate spaces in the garden. An optional floral arranging workshop is offered with Colonial Williamsburg landscape supervisor Susan Dippre and landscape foreman Hunter Curry. Participants learn how to layer flowers in an arrangement and receive flowers and a container to take home their own arrangement. $45. The Colonial Williamsburg Foundation and the American Horticultural Society (AHS) are co-sponsors of the 69th annual Colonial Williamsburg Garden Symposium. Financial support for the Saturday morning sessions is provided by the Phoebe Moyer Garden Symposium Speaker Fund. Cost for the symposium is $295 per person, $265 for AHS members. Registration for the conference and optional programs can be made by calling 800-603-0948 or online at www.history.org/conted Complete program details and conference brochure, directions, program locations, conference hotel rates and dining and spa options are also available online.